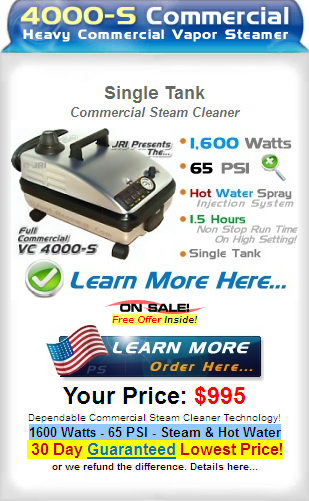 How are Industrial Dry Steam Vapor Cleaners Different? There are a lot of so-called steam cleaners on the market today, but industrial dry steam vapor cleaners offer several benefits over residential models. First developed by Italian boiler manufacturers in the late 60s and early 70s, the tremendous potential for pressurized, low moisture steam as a cleaning solution was immediately apparent. The dry steam cleaners quickly sowed how they could quickly clean and sanitize a variety of surfaces. Since then, the use of dry steam vapor cleaners has continued to grow as a modern, economic and environmentally sound way to clean offices, homes, hotels, and more. Industrial steam cleaners today rely on this technology and the advancements that have come to make the machines safer, lighter, and easier to handle and use. Effective cleaning and sanitization with modern industrial dry steam cleaners is unprecedented. The high temperatures of the steam softens grease, oils, fats, and otherwise reduces the molecular bonds between dirt, grime, and a variety of surface. This then allows the pressurized steam to dislodge particles from those surfaces without relying on harsh cleaning chemicals. The remaining dirt and debris can be wiped or vacuumed away quickly and easily. Those same high temperatures kill bugs and bacteria including bed bugs and those germs that carry a variety of illnesses and potential health risks. This method can be used to clean car engines and other machines. With 5% moisture or less in the active steam stream, commercial steam cleaners allow for a wide berth when determining where it can be used. The dry steam makes cleaning tasks easier and less taxing when compared to using cleaning chemicals, towels, sponges, etc. With the pressurized jet of steam being ejected from the nozzle, hard to reach areas can be cleaned with ease. Because the steam’s temperature drops quickly once in an open environment, it is safe to use and use around others with a modicum of safety mindedness. Because steam and pressure are doing all the hard work, you can help safeguard the health and safety of your employees, vendors, clients and customers by not relying on hazardous chemicals for cleaning. These chemicals have been linked to a wide variety of illnesses including cancer, asthma, and chronic fatigue syndrome. Furthermore, by not using those toxic chemicals to clean your business, you will not be introducing them into the environment. That is environmental responsibility, which everyone is making a move toward showing these days. Also, the amount of water used in most industrial steam cleaners comes out to be less than a gallon per an hour, which means you are also cutting back on the cost and consumption of fresh water. The pressurized steam from industrial dry steam cleaners can be used to clean windows, stainless steel, tiles, grout, polished surfaces and more. The effect leaves no streaking. It can be used to remove grease from kitchen hood, grills, and ovens while also being gentle enough to remove stains from carpets and removing mold from walls and ceilings. 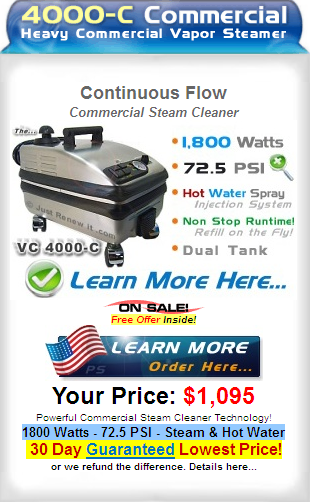 It would be a hard task to find any cleaning tool or method that is as versatile or as effective as pressurized steam. 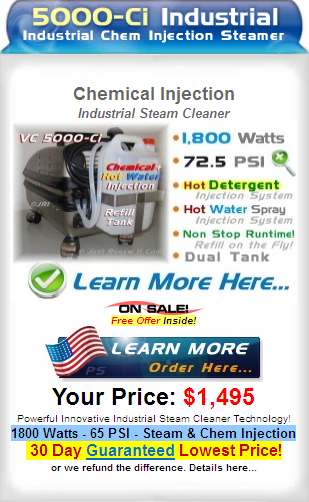 When you look at all the benefits of an industrial steam vapor cleaner, the question remains why NOT to have one. These units provide the easiest, cheapest, healthiest, and most responsible cleaning available. The heated steam allows you to weaken the bonds that hold dirt and grime to surfaces. The pressure of the steam then pushes those contaminants away from whatever surface they were adhered to. With pressurized steam, you can save money by not needing to spend any more on expensive and ineffective cleaning agents. Water—and heated steam—is simply the most effective cleaning you can have. This can reduce your yearly cleaning cost by hundreds or even thousands of dollars, simply by not using something that did not work as well as water. Today, we are seeing many more illnesses caused by environmental contaminants. The past several decades have shown an increased risk of cancer, asthma and other illnesses—illnesses directly related to environmental contaminants. One of the key contaminants we come into contact with regularly is also one that we can control and that is the wide variety of chemical cleaning agents that we have relied upon for years. If necessary, you can still use cleaning solutions for those truly stubborn and difficult areas and stains where steam will not work, but by not having to use those regular products that can be harmful to environment, you can afford to invest in natural products that are biodegradable and safe. Beyond limiting the amount of cleaning agents you will need in your business, you can also reduce the amount of water used in cleaning. Forget those 10 gallon buckets for mopping the floors. Instead, use an industrial steam cleaner that uses less than a gallon of water per hour. This can be a tremendous savings, depending on how much you currently need to clean your work area or facility. So, you get to put less harmful toxins into the environment while also limiting your consumption of natural resources. That makes for a win-win situation for any company that is looking for ways to improve the efforts to go green. By removing chemical agents from the cleaning repertoire, you are also enhancing the quality of life of your employees and customers. Many asthma and allergy sufferers are hyper sensitive to cleaning agents. By removing those chemicals from the equations, you will not be exasperating their symptoms. At the same time, some cleaners require you to make sure no one is around or that the area is well ventilated. You do not have this issue when what you are using is simply pressurized, heated water. By properly sanitizing your work environment, you can limit the amount of illnesses suffered by your workers and the overall spread of germs through your establishment. How much productivity is lost to employees falling ill? Imagine being able to reduce that by sanitizing regularly with the power of a dry steam vapor cleaner.